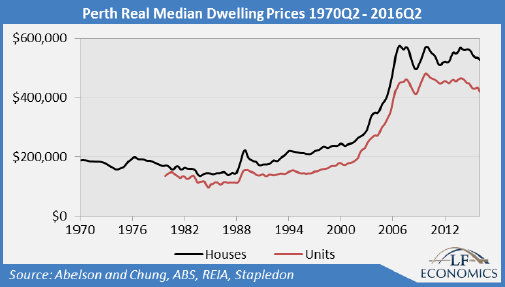 Real and quality-adjusted housing prices peaked in 2007Q1, having risen rapidly from 2001. While rental price growth tracked consumer price inflation, gross and net yields compressed sharply. Despite the steep rises in rents, incomes, and population since, housing prices have declined moderately, registering small rises and falls along the way. The best leading indicator of housing price growth is the mortgage debt accelerator (the change in the growth of mortgage debt). 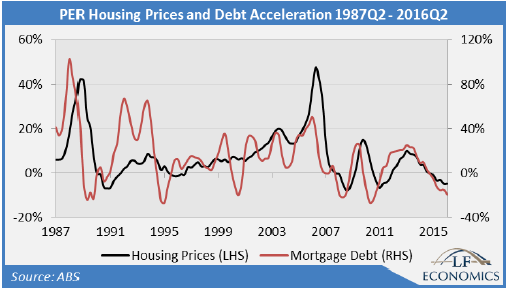 There is a visible correlation between the debt accelerator and the change in annual nominal housing prices. When prices are lagged by 2 to 3 quarters, the correlation becomes stronger. This speculative debt-financed dynamic dictates the direction of house prices better than any other fundamental. 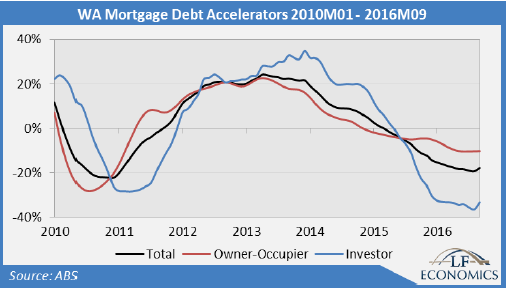 The WA mortgage debt accelerator is now plunging. 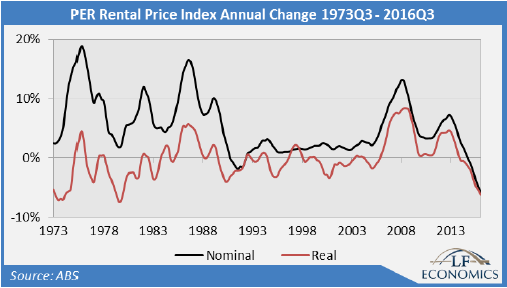 Nominal housing prices have followed, more so in real terms. With the debt accelerator negative, the price trajectory should follow for at least the next two to three quarters. The mortgage debt accelerator can be separated into two components: owner-occupier and property investor. Property investors tend to be the price makers rather than owner-occupiers; therefore, it is the trend in the former which matters most to prices. The data suggests Perth dwelling prices and sales volumes will remain dormant, to the disappointment of landholders. The mining construction boom proved a magnet to many, with WA experiencing the greatest population growth of all states and territories over the boom. Just as citizens and immigrants flooded into WA, the reverse is now taking place. Immigration has sharply declined and there is now a net interstate outflow. 2016Q2 recorded the lowest annual change in population, at 1.05%, the lowest growth on record in decades. 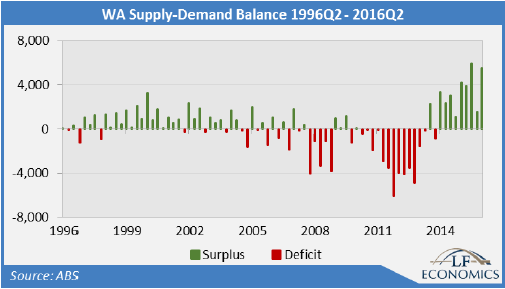 Given the economic conditions, WA will likely experience negative net population growth in a couple of years’ time. The effect on the housing market is entirely predictable. 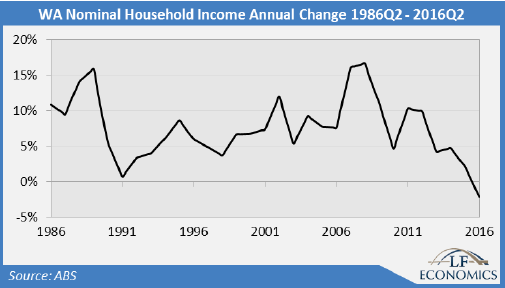 The household sector has become so weak that the annual change in aggregate nominal household income has been negative in recent quarters, worse than during the early 1990s recession. The trend is clear: as both population and nominal wage growth plummets to record lows, household income will continue to weaken. This helps to explain the fall in rents and other forms of spending such as car sales. WA’s housing market presents an intriguing case study of supply and demand given the volatile imbalances caused by the mining investment boom. The supply-demand balance is constructed by comparing the flow of dwelling completions (adjusted for demolitions and secondary homes) against the flow of new households, decomposed from population flows. Until the mining investment boom ramped up, surpluses dominated, with a small overhang of dwellings and rent growth tracking inflation. The combination of a large influx of population and moderate dwelling completion growth meant deficits quickly escalated. Rents increased strongly, evidence of a dwelling shortage. As the mining investment boom ended, this dynamic quickly reversed and rents have plummeted accordingly. In fact, the decline in rents is worse than the data makes out. Investors are attempting to stem the fall with incentives not recorded: free rent for a month, gifts (iPad, vouchers, etc.) and small renovations – landscaping, air conditioning, etc. – to sweeten the deal. Rental ads on realestate.com.au and Domain demonstrate this. It is remarkable that a small construction boom lifted off (probably stimulated by the housing price growth in 2013) while population growth collapsed. Large dwelling surpluses will continue into the near future, and will likely increase as population growth continues to decline. 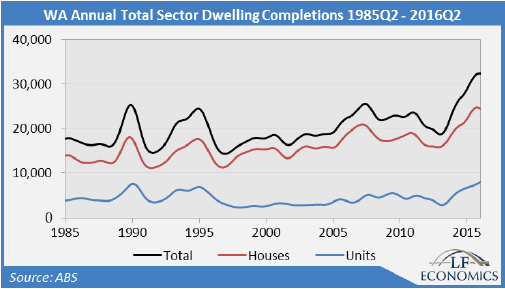 Approvals data shows construction activity already moderating but large and persistent dwelling surpluses will ensure future negative rent growth. Combined with small rises in the nominal mortgage interest rate, LF Economics sees property investors hit hard from both ends of the balance sheet. The downturn in rents will predictably devastate the balance sheets of property investors, many lured into the market by previous rises and thinking the mining investment boom would continue for a lot longer than it actually did. It is difficult to blame the average investor for their poor judgment when this view was broadcast without pause from the highest levels of government and industry. Gross yields have been compressing over the last couple of years, but not for the usual reason of prices rising faster than rents. Perth is producing the opposite: rents are falling faster than prices. This means the property market is unattractive to both speculative and value investors – hence the downturn in the mortgage debt accelerators. This is great news for tenants, enjoying something denied by the mining investment boom for a decade: falling rents and dwelling choice. Market power has swung decisively from investors to tenants. An investor’s yield without a tenant is zero. Given the unavoidable expenses, the net rental income is (considerably) negative. This is why negative gearing [for tax purposes, being able to deduct rental losses from ordinary income] is so important to property investors. Property investors cannot borrow against lost equity, and their Ponzi finance schemes are struck firmly in reverse gear. The fall in housing prices is also good news for aspiring first home buyers (FHB), as is the downturn in sales volumes. FHBs now have superior bargaining power with increasingly desperate vendors – and every incentive to await further falls. But buying now can be characterized as catching a falling knife. Renting, sharing or staying at home with parents is a rational response to these troubling conditions, especially given the tenant-friendly conditions that now exist in the rental market. All indicators show the current downturn in both housing prices and rents will continue into the near future, and a reversal is very unlikely to occur. Despite the evidence, vested interests will continue making entirely predictable statements that recovery is just around the corner. Unlike Sydney and Melbourne, aspiring FHBs are fortunate that the government and industry fabricated ‘Great Australian Dream’ is coming closer, given the gradual downward drift in housing prices. As nominal wage growth is at record lows and mortgage interest rates are rising slightly, the only way for housing to become more affordable is via price reductions – which are presently the case in Perth and the rest of WA. In conclusion, the Perth and WA housing markets represents a systemic danger zone for the national housing market. Investment is unattractive to value and speculative investors alike, and the option of buying now for FHBs is a risky knife-catching act. Without a Mining Boom 2.0 to sail to the rescue (hint: it’s not going to happen, with massive overcapacity and overbuilding in China), the housing market will remain in a protracted downturn. By LF Economics’ co-founders Lindsay David and Philip Soos. The entire report is here. WA in Au with mining in decline, is like Alaska with out oil in the US. And its effect on the real housing market in the rest of Au, is like that of the Alaskan property market, on Prices in NYC. If the average price of family housing in WA drop’s another 50% it may again become affordable for the people who live there, and do not make their living from mining. People born in WA have been driven out of it, by the mining-boom’s inflationary effects on municipal costs, and housing, as has industry outside mining. Even the girls working WA. Particularly in places like Port Headland, were FIFO, as it was simply to expensive for them to live there. One of the thing’s you don’t hear about the Mining-boom is the damage it did to WA community members, not involved in mining. Did you know that property prices in NY are going down? Without oil, so work, what percentage of the population wants to go to Alaska and what % of the population would leave Alaska if they could find a good job elsewhere. Prices in almost all the global bubble city’s are going down, in some sectors. Mostly the highly speculative/investment and luxury sectors, not single family homes. Yes, Yes, living here I can attest to the fact that a few family members working in housing construction are either out of work or on call if there is any work. My customers are telling me that Q1 is a make or break for some of them with no work on the horizon. We have a government that has been supported by the only local newspaper who’s owner is heavily invested in the mining support industry. When there was talk of increasing the tax on mining to reflect the quintupling of profits by the mining sector the mining industry support by the Liberals (think GOP) scared the 🐴. Also there are three major mining projects ready for completion this year meaning some where in the vicinity of 25K construction workers out of a job. Yes lazy politians drinking the coolaid of Dutchy disease and now we are royally screwed. I have just renegotiated my rental (business) down by 15% and see next year I will by a similar margin as the complex I’m in is half empt while the landlord played hard ball with his now ex tenants. To closely link the Western Australian economy with China, a week ago several commodity investment bulletins reported iron ore inventories at Chinese ports have hit a new all time record on December 31, standing at 115 million metric tons. In terms of days of inventory we are back at over 40 days, something unseen since the very early days of 2012. In short there is nothing sustaining the iron ore rally but a wing and a prayer… and a lot of old fashioned inflation. Iron ore prices, having more than doubled in 2016, have started to correct: in the hours following this announcement prices immediately lost a few dollars/ton. This is of course until the People’s Bank of China will step in to save commodity speculators. They’ve already done the same with cotton, copper and a host of other commodities. No wonder the size of their currency reserves is subjected to much suspicion. Regardless, a much smaller rally in oil prices was enough for US fracking outfits to enter a renewed phase of frenzied activity which, together with OPEC and Russia still leading supposedly “smart” investors by the nose, has accounted for oil’s wild gyrations over the past few weeks. While iron ore prices have not gone anywhere near the “magic” US $100/mt, a doubling in value over a single year is not too shabby. In June 2016 (the last month I’ve been able to find data for) Port Hedland exported 39.6 Mmt of iron ore, a new all time record. As the saying goes, the wolf may lose its hair but never loses the vice… PBOC or not expect the brief vacation for Western Australian economy to be over soon. Heading into the storm season so the inventory needs to be up. You need to look at wherer the stockpiles in Headland are. Looking at the historic series for iron ore held in Chinese ports starting in January 2010. Inventories have always peaked in July for the year, except for 2015 when they peaked in October, and 2016, when they peaked in December. This is a highly unusual pattern, even more so when one considers usually inventories in Chinese ports were quickly drawn down starting in August and started to build up again in October. For five years the pattern was exactly the same. Then came 2015 and 2016. It’s no mere coincidence Port Hedland experienced that spike in exports this past June: by looking at my chart I see a massive spike in inventories held at Chinese ports in July, then a plateau and then inventories started to build up again in September with another massive spike in December. The Chinese government is playing one of their usual tricks here, the weather has nothing to do with this. How much of it is the State, and how much of it is that great ball of chinese speculators cash, borrowed at 1%, that cant get out of china, so simply keeps bouncing from bubble to bubble within it. Creating more problems for china, and everybody else, wherever it goes. Coal prices are also falling. The A$ should start to reflect those falls soon. Ans where are those people going? Mainly to Victoria and Melbourne in particular. WA loss is Victoria’s gain. Way back when during the boom, wages were soaring. How much do you say? Well a manual labor worker in a warehouse (not whorehouse!!) could make over A$150,000 a year for working a couple of hours overtime a day and doing work on weekends. Banks would close during lunch hours as they couldn’t find people to staff the bank. All that is gone now and those houses renting for A$50,000 a year are gone as well. Impact on the rest of Australia’s housing market: increased demand for the people leaving WA and moving to other states. I am basically a bull (start the bashing) but what I have been seeing on commodities markets over the past six/seven months has sent all my internal alarms ringing. It’s exactly the same thing I saw back in 2008, but fundamentals sustaining the whole charade have weakened considerably. Starting from China. China has been stockpiling, possibly as a way to disguise trade surpluses. Or they anticipate large currency movements, not in their purchasing favour. With china its hard to tell. But a lot of resource stockpiles, have grown considerably. I do the indexes on some of this, I would not touch the futures, for the reason’s you outline. One thing I can tell you is they aren’t stocking up on rice, which is highly unusual considering prices have been depressed since 2013 and the speculative flame we had earlier this year has not merely died out but backfired, with prices at five years lows. Palm oil is doing better, but better means in 2016 prices somehow picked up after the unfathomable depth reached in September 2015. Pork on Asian markets is at a ten years low and still in free fall. One of the few useful things I picked up with age is when China is not buying rice, palm oil and pork, something is up, usually something serious. “A$150,000 a year for working a couple of hours overtime a day and doing work on weekends. I’m not sure even a fluffer makes $150k? Were the houses blown away in a storm or are they just not available due to high demand? Australia And NZ dont have Trailer homes like the US. They have a fully size stand alone house moving industry, sometimes they build them in two pieces and move them that way, if they are odd shaped. A lot of WA vacant stand alone homes, will simply move to outback towns, Stations, where they will be used as replacements for older homes effected by termites, age, decay Etc. The Rural Australian environment, is hard on houses. Its a regular occurrence when mine sites are shut down. It avoids the rubbish let in the environment of ghost towns. Australia would be covered in them if they wern’t removed when the mine sites played out. It may be financial macho to watch and analyze these extreme regional cycles – but in the end it is just more free markets exploitation that only serves to move huge amounts of money around for no real long term purpose except get rich quick schemes. As a money manager I’m sick of this type of investment mentality. 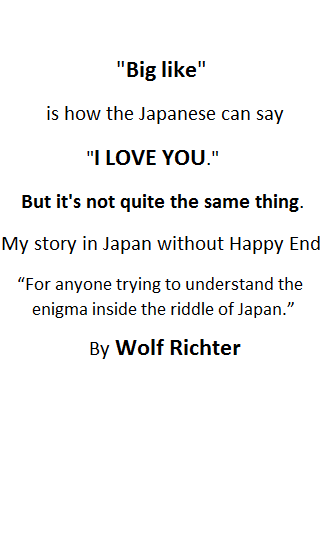 Sure, it’s part of the real world, but to what valued end? It always seems to end in either painful population displacement, vulture capitalism scooping up distressed assets, or environmental devastation as the “cost” of wealth creation. Underlying all the statistical facts of these boom and bust cycles is a false assumption that this is all just global capitalism doing its thing. Well, count me out – unless I can see real long-term value created. I believe we can thank central banks for the speculative swings, they’re well paid for all their hard work. Consider when the financial world is so top heavy and growth is emphasized (IMO: climate change concerns), the seas of liquidity tend to produce heavy tidal currents? It takes just a spark to ignite the dry tender. free market capitalism is the best path to prosperity. “an investors yield is zero without a tenant.” the key to the next price decline here in the Bay Area. Great article. Still a LOOOONG ways off in my opinion. Twitter or someone needs to go bust first. Once that floodgate has opened then it’s the beginning of the end. I am aware that Wolf has pointed out the presence of similar incentives (free rent for one/two months), etc disguising the drop in rent, but that too only impacts the 3K and above market. The lower end is still pretty expensive for what you get. I know, because I am staying in one. I’m wondering when they begin offshoring, certainly layoffs will be a 1st indicator? I’m a bit puzzled by many of the statistics in this article. First of all, a 200% house price increase in 40 years (or in 20 years) isn’t much of a boom IMHO. The price gains in my country, and probably many others, are FAR bigger (like +1000-1500% within 25 years). A ‘systematic danger zone for the national housing market’?? I’m wondering if these prices reflect the whole WA housing stock, or just investor properties that are rented out? How much of the housing in WA is rental vs. occupier-owned? The population dynamics, rent prices etc. don’t make much sense. Also the charts suggest that the often referenced supply-demand imbalance had very little effect on house prices (maybe it was countered by the other effects of the mining boom, but still strange …). In my country home prices are at their highest value in 400 years, both absolute and relative to incomes. Prices are widely expected to keep rising for at least another 1-2 years, maybe with the exception of the top of the market where debt leverage doesn’t work as well. Rents are expected to keep rising even more (and if they don’t, government will get working on it). Building activity over here isn’t much, but the population has been relatively steady for years except in the big cities; if it weren’t for the recent migrant surge, in many areas the population would be shrinking and very little supply would be needed. Of course government is happy to help the RE mob a bit by razing down whole neighborhoods from time to time because the homes are ‘outdated’ (= too low rent, to be replaced with far more expensive rental units where the original renters can rent again with huge rental subsidies). Awesome data of mortgage debt increase versus marginal price of housing. Confusing: Why do they call it mortgage debt accelerator? The rate of change in mortgage debt ought to be called speed, not acceleration. Maybe it is just a misnomer that has gotten entrenched in the field of economics. Still huge restrictions on uranium mining. Although you can basically walk out and scrape it off the surface in a lot of places. I live in Perth, a mate recently lost his job, highly skilled, although not in mining he decided to move back east (Sydney) he has had difficulty finding a removal company, they are booked up solid. At least there is one business still thriving in Perth, the overall situation continues to tighten, you can feel that people are slowly becoming more concerned as time goes by, up until recently most people believed that the mining downturn was temporary, cyclical, would only last a few years and then it would be boom times again, now people have a small amount of doubt in their minds.